The first time I saw this little grey box in a store I thought it looked interesting but just couldn’t imagine good video coming from a tiny little camera. And then it didn't have a LCD screen? Deal breaker I thought. That was a few years ago and since then GoPro has really made some great improvements. I got to meet one of their representatives and when she handed me the camera I was sure it was going to be a little gimmicky thing that really wouldn’t measure up to what we as kayak fishermen want in a camera. Boy was I wrong! First thing I did when I got home was check out what it could actually do. I checked the videos that were uploaded on their website and my jaw dropped to the floor. This thing had some serious horse power in video picture quality. It runs at 30 frames per second at 512 X 384 pixels and also shoots a 5 mega pixel photo. It’s got a wide angle “fisheye lens” that captures everything in a 170 degree radius. Not only does that make everything you shoot look cool, but you really don’t have to worry about getting what you want in the shot. Point the cam in the general direction and you’ve got it in frame. 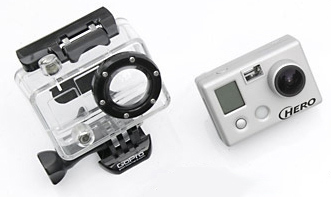 It has a few different modes: Video, standard photo, photo every 2 or 5 seconds, 3 photo sequence, a self timer, and the ability to flip the image upside down (so if you mount the cam upside down the video/photo will be right side up). I used a 2GB SD card (not included) and according to the spec sheet that left me with 56 minutes of continuous video time and 1,945 photos. If I upgraded to a 4GB SDHC card video would go up to 1 hour and 52 minutes. I got a few mounts to go along with it and the most useful were the head strap mount, suction cup mount, chest mount harness, and the seatpost mount. The last is actually made for mountain bikers but works great on a length of PVC mounted in a vertical rod holder. They all articulate well and overall are priced reasonably. So next I took the GoPro out on the sound for a real world test run. All the mounts worked out well and each have their place depending on what kind of shot you want to get. 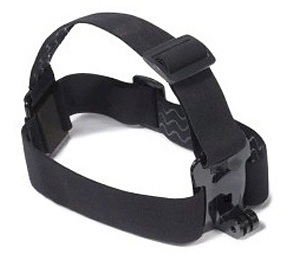 My favorite of all of them was the head strap mount. It’s perfect for catching action shots while fishing and makes sure you don’t miss any of the action since wherever you look it follows. 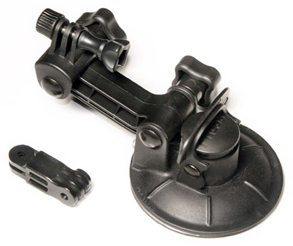 For those with kayak that don’t have a textured surface, the suction cup mount also has a great angle and stuck around firmly. One thing I did give a try that also turned out well was just holding it out with a straight arm as I did stuff. It turns out looking really dynamic with the wide angle lens and with some smooth movements looks rather professional. One thing that wasn't a too user friendly at the beginning was the LCD screen that showed functions and the flashing red record light. The test was done in some pretty sunny weather so you'll notice in the handheld video that I have to make shade with my hand to confirm it was recording. But after using the camera a few times it's easy enough to check and you remember the icons and how to cycle through them. When I got back home to check out the footage the first thing I noticed was the picture quality. Wholly crap! It looked so sweet on a full size TV screen I was shocked that I even shot the videos. This isn’t just a little 4X5” square on your PC, this is a full-fledged TV quality video that can make some truly incredible home movies. One thing that’s really hard to find in any video cam, let alone in a 1.75” X 2.30” X 1.25” box, is video that comes out with true colors. Meaning that your final image isn’t washed over in a palette of grey or blue. The auto white balance in this unit works wonders and colors come out very true. Next thing I noticed was the sound. It’s in an underwater housing rated to 100’ so as expected it’s not that great. It’s pretty muffled and probably the biggest drawback of this camera if you’re looking to use it out of water. I did get a little funky squeaky sound when I recorded the attached videos but customer service quickly exchanged the camera and further recordings came out clean. Overall, for the cash (Retail $139), I don’t think you could get a better tough little waterproof camera that’s capable of so much. If kayak fishing videos are your thing the GoPro Wide is where it’s at. Well, then again GoPro has come out with a Wide HERO HD and the picture and sound are even better! I hope to get a review on that shiny gem soon.